We live on a planet filled with nature in its myriad forms – animals, plants and creatures of all shapes and sizes. As human beings, we are expanded not only in our thinking, but in our hearts, when we connect more deeply with them. Many worlds thrive and evolve just beyond our human awareness; everything from the microscopic and macro-photographic levels to the far cosmic reaches of our galaxies. Fortunately, others are willing to share their photos and knowledge with us. Connecting more deeply with the wholeness of the planet, and thus, with your own wholeness, has many benefits. It isn't just about "hugging a tree," although there is nothing wrong with that either! Becoming more connected to nature helps you to slow down to a more natural rhythm as you listen to the "heartbeat" of the earth. For students of The Radiance Technique® (TRT®), you can expand and deepen your bond with the living energies of the planet that include animals, plants and cycles of life. As we learn more about nature, we also increase our awareness of what is natural from within... and that knowledge expands with the use of TRT®. TRT® is great to use out in nature, for example, swinging in a hammock, walking on a hike, sitting on a blanket in a nearby park, or relaxing in your own backyard. Wherever you are, TRT® is there with you. With your Radiant hands-on, you breathe with the rhythm of nature and you begin to sense, from within, what is real and what is not. The Radiance Technique® and The Animal Kingdom, by Marvelle Lightfields, is a book about using The Radiance Technique® with animals. The excerpts are from those who have already studied TRT®, but even if you have not had a class, it gives you an idea of how this technique can be used with the animal kingdom. Beginning with The First Degree of The Radiance Technique® you are able to use your TRT® hands-on with your pets whenever you touch them, caring for them and loving them. For wild animals, you can direct universal energy as you are taught in The Second Degree of The Radiance Technique®. This is particularly important to not feel "helpless" when others need our support – when it is not possible to be there in person, or to physically apply our hands-on. 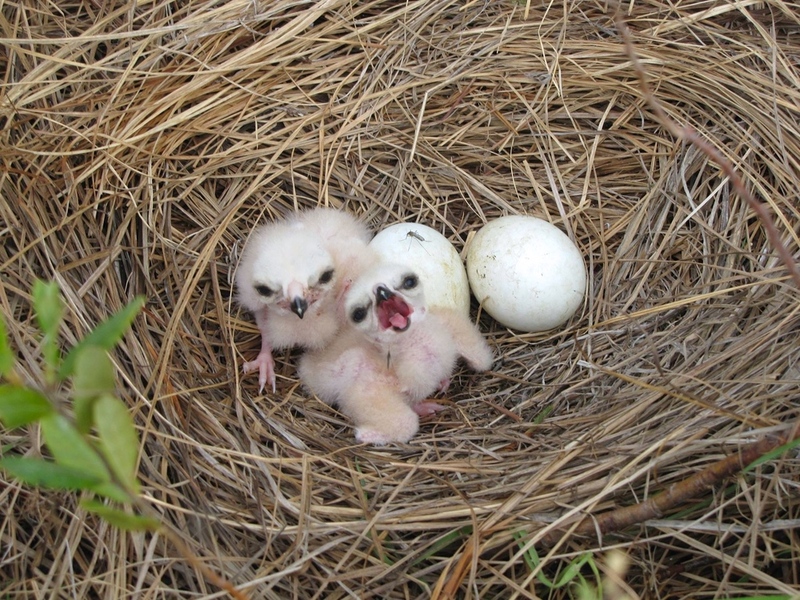 Newly hatched chicks, Northern Harriers, which, unlike many raptors, nest on the ground. These newly hatched chicks are in the wild, and should not be physically touched by us. Sometimes, keeping a physical distance apart is important for their well-being. With TRT®, we can still be near in our hearts. As we become more aware of nature, we are able to deepen our connections – with nature and with each other.